Load up your AK-47 or Galil magazines with ease with the maglula loader and unloader! 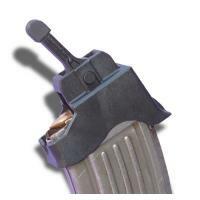 This maglula loading tool allows you to painlessly load rounds into the magazine in half the time. The all-in-one magazine speed loader/unloader is compatible with AK-47 7.62 x 39mm and Galil 5.56 x 45mm magazines. Simple to use, the loading process does not involve using thumbs or fingers saving you from pain and potential injury. Made of reinforced polymer material that is durable, the loader has been combat proven to be reliable. Its lightweight design can fit into your pockets and is the perfect tool to have in your range bag. The maglula loading and unloading tool will also eliminate wear on feed lips thereby extending the life of your magazine. SCAR H / 17 LULA - 7.62 x 51mm / .308 Win.